Preferences (this is the “File” main menu option for Windows users) – click the “Preferences” main menu option or enter “⌘” + “,” on your Mac keyboard to be taken to a dialog containing a set of preferences. 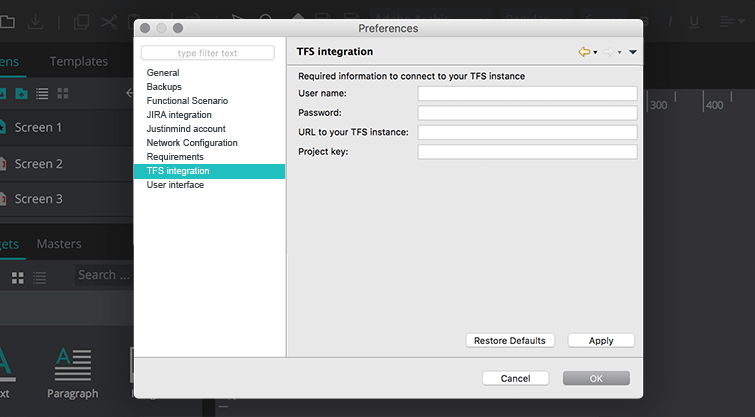 See the “Preferences” section below for details on this dialog. 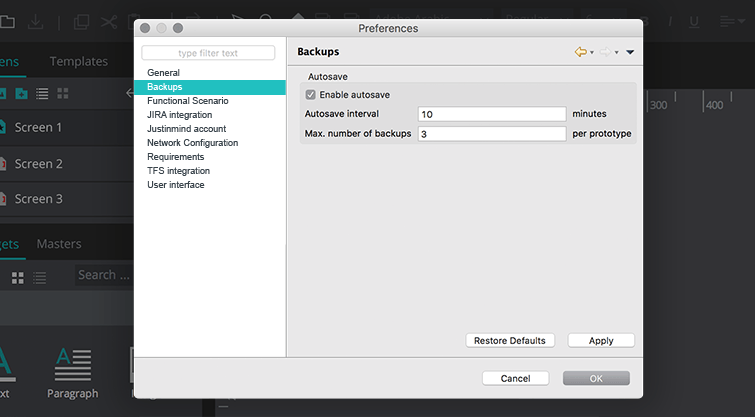 Click “Apply” to save your changes or “Restore Defaults” to restore default factory settings. Import JGL – enter your JIRA JQL here. Find more info on constructing a JQL here. Learn more about Justinmind’s Atlassian JIRA integration here. 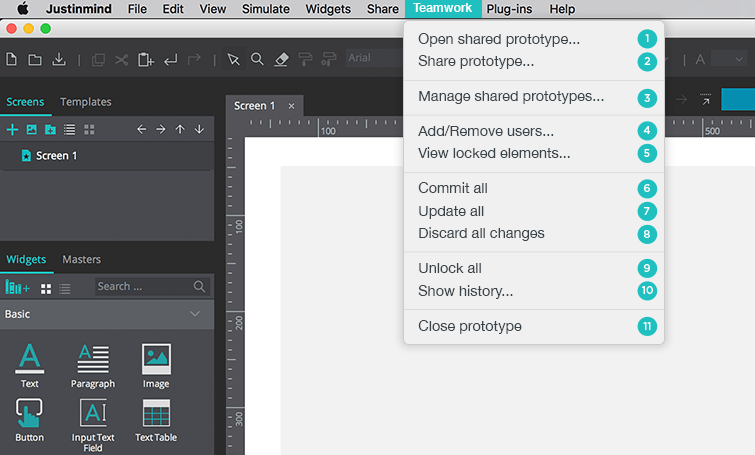 Lock elements automatically – tick to lock elements automatically when working on a shared prototype. Learn more about Justinmind’s Teamwork features here. From the “File” main menu option, you can perform operations related to the handling of Justinmind files that help the user perform specific tasks. The current prototype will be closed. 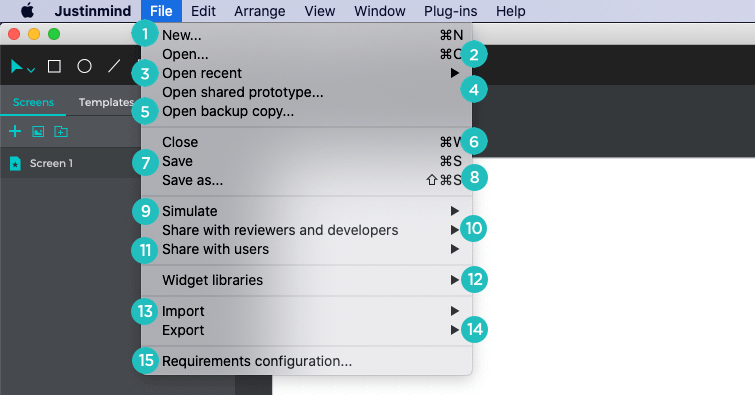 If you want to open more than one prototype at a time, you can either launch two prototypes or double-click on each of the .vp files. The current prototype will be closed. If you have no internet connection you will be requested to work offline. Exit – click to close Justinmind. 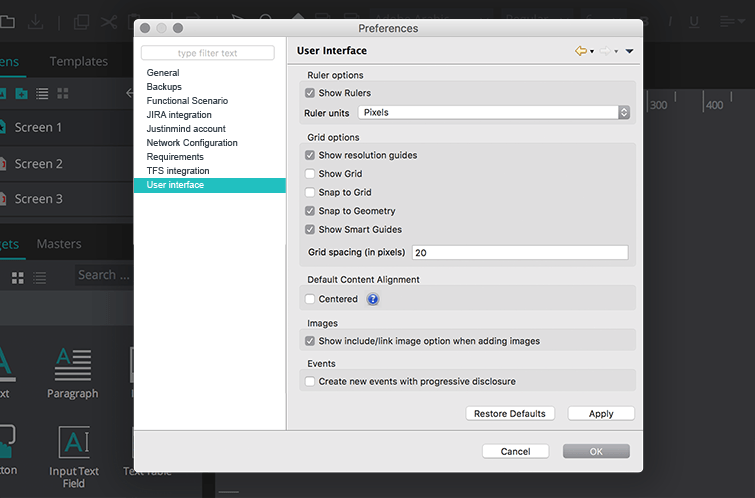 You will be prompted to save any open prototypes. From the “Edit” main menu option, you can perform operations related to the handling of information within a Justinmind prototype. 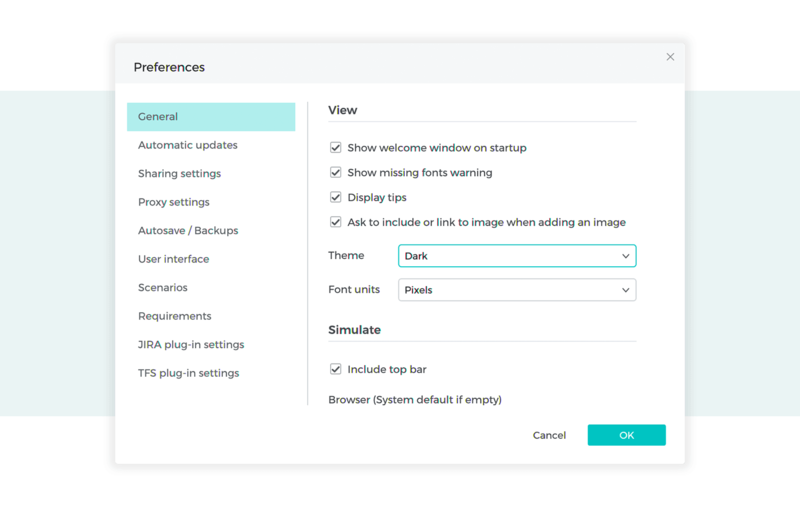 Replace styles – click to open a dialog to find and replace the attributes of elements in a prototype, including their font family, font size, font color, and background color. 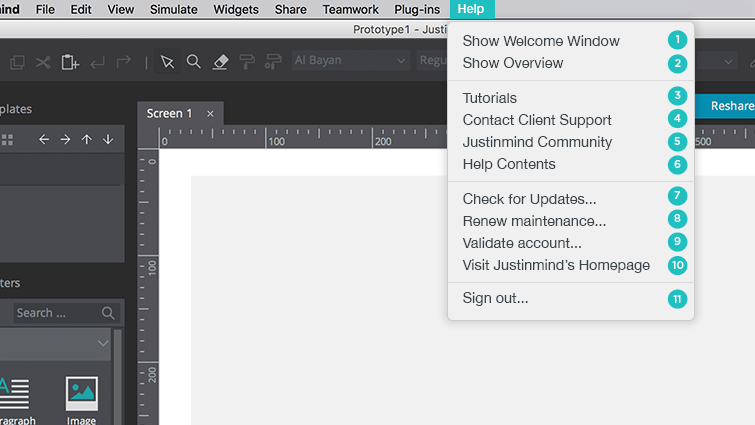 From the “View” main menu option, you can perform operations related to the appearance of the Justinmind workspace. The View commands differ depending on the Module you’re in. From the “Simulate” main menu option, you can perform operations related to the simulation of a prototype. 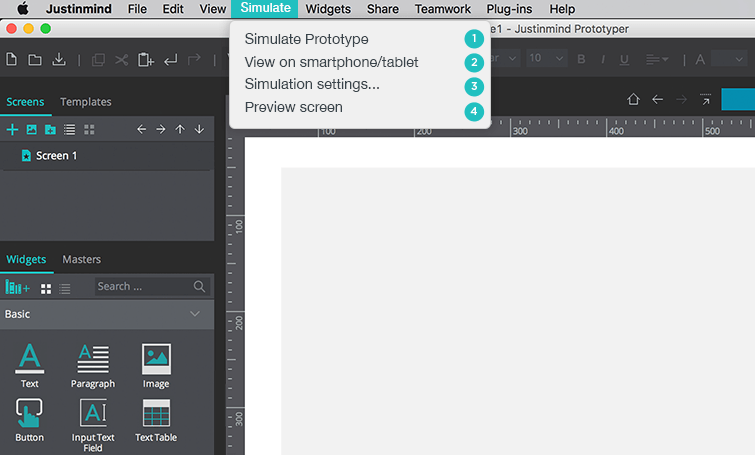 View on smartphone/tablet – click to publish your prototype to your account and view it with a real mobile device using the Justinmind mobile application. From the “Widgets” main menu option, you can perform operations related to Justinmind’s Widget libraries. 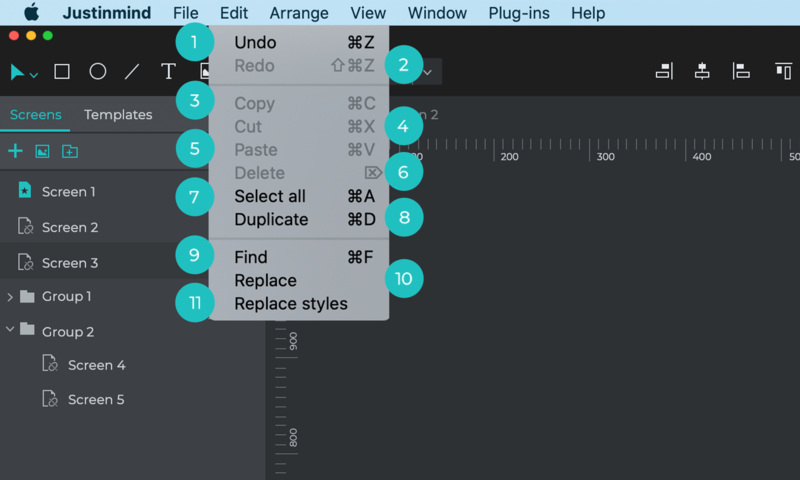 New Widget Library – click to create your own widget library. Learn more about Widget libraries here. Learn more about working with shared prototypes here. From the “Teamwork” main menu option, you can perform operations related to team prototyping. 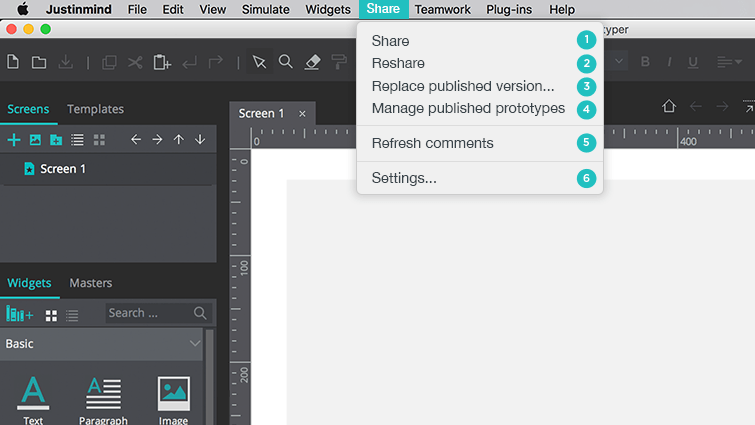 Learn more about using our Teamwork features here. From the “Plug-ins” main menu option, you can perform operations related to your Justinmind plug-ins. 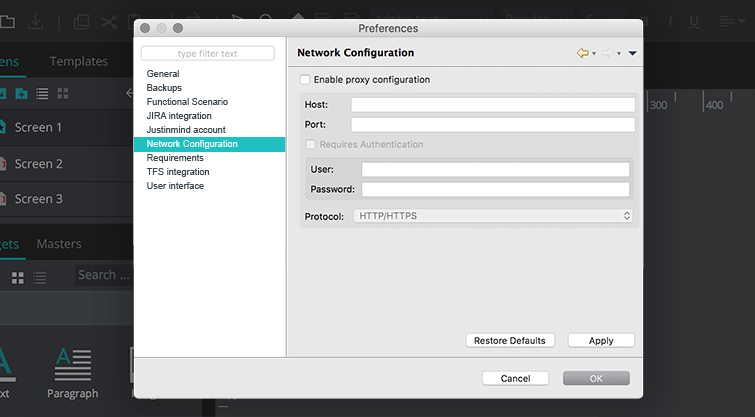 From the “Help” main menu option, you can perform operations related to account and prototyping support. Show Welcome Window – click to view the Welcome dialog that you see upon first opening Justinmind. From here you can create a new prototype or open an existing one.